The thought of eating insects may give diners the heebie-jeebies, but some experts insist bugs are the food of the future. They're cheap, sustainable, and packed with protein. And as this innovative design featured by Fast Co. Exist shows, it's possible to farm them in the hearts of major cities. 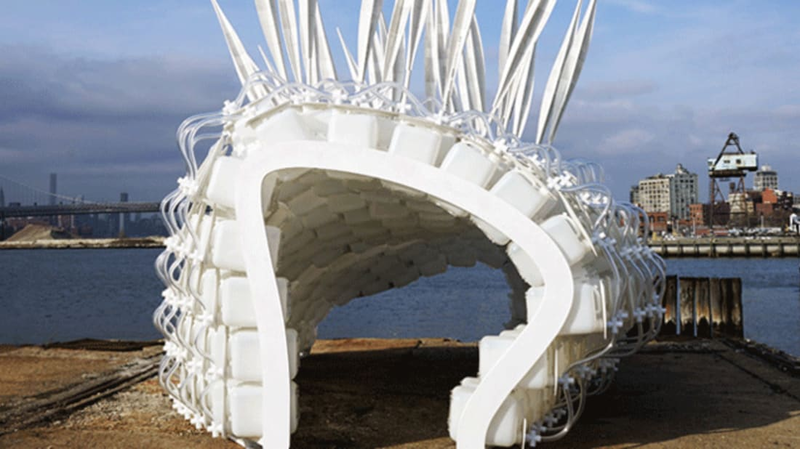 The Cricket Shelter is a structure that consists of pods built to hold thousands of crickets. It was designed by the architecture firm Terreform and currently occupies a dock at the Brooklyn Navy Yard. If the idea takes off, the shelters could be used by small food producers to raise crickets on rooftops and empty lots in urban areas. Not only does the Cricket Shelter house around 22,000 insects, it also cleans up after them at the same time. It's designed to collect dead crickets and their waste and makes them easy to dispose. The structure gives crickets plenty of room to roam around while still fitting in as many insects as possible. And when they're ready to harvest, all the insect farmer needs to do is turn a dial on the pod to empty them out. The structure was originally designed to shelter people during disasters, with the nearby food source acting as a bonus. "Here you have the sound of an organism that supplies sustenance for yourself and your family," Terreform's founder Mitchell Joaquim told Fast Co. Exist. "As long as you have that, there's a bit of comfort that you can make it through this disaster. Once the disaster's complete, you can still use these shelters as a source of income." Now, the team behind the shelter is focused on breaking into New York City's health food scene. They're interested in experimenting with different types of feeds—like apple cores, lime rinds, and orange peels—to develop more complex flavors in the final product. And while they don't suspect Americans to embrace whole insects on their menus anytime soon, they are optimistic about the future of insect-based flours. Pulverized crickets can be used to make high-protein delicacies like pasta and health bars. At the present, Terreform is collaborating with a local entrepreneur to launch a line of cricket-based snacks this summer.